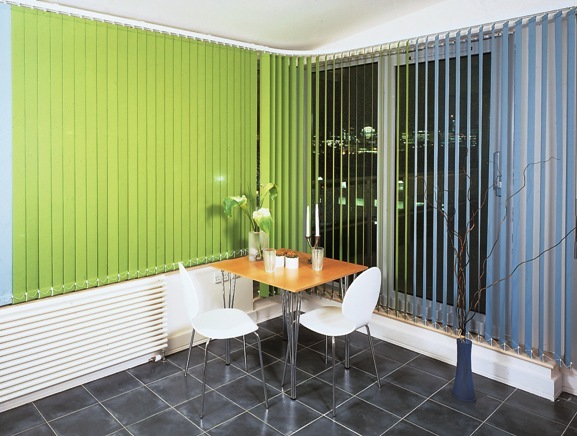 Whether you are working around existing blinds or curtains or starting from with a blank canvas, you should always consider the effect you are introducing with a vertical striped fabric, wall covering or paint effect. Every room has vertical lines by virtue of the fact that the “bones” of the room are formed by corners, so it’s just a question how vertically inclined you want to go. 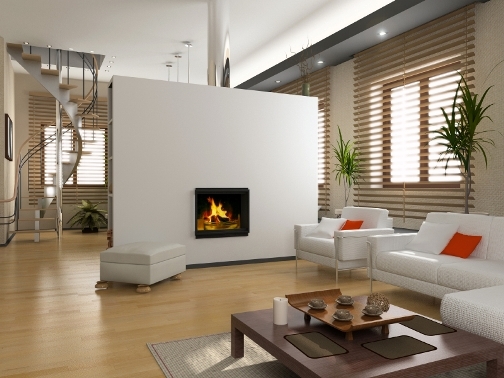 Vertical lines introduced to a room will balance the unavoidable horizontal elements of the room particularly in a living room which has dark coloured furniture or horizontally inclined window treatments such as Venetian or Roman blinds. Bedrooms and living rooms especially need harmony and unity to create a relaxing atmosphere, often essential for a good night’s sleep or for unwinding time after a busy day before trying to get a good night’s sleep. Curved vertical lines on the blinds, curtain fabrics or wallpaper will soften the effect adding a feminine feel particularly to a bedroom by counteracting the harshness of the vertical stripe. Although the dimensions of the room may be limited there are a few principles of interior design that may well help you to maximize the look of the existing space by using vertical lines to add height to the room but going back to the corners of the room, if your house is badly built or old, then the corners may not be that suitable for striped wallpaper in particular, as the stripe will “run out” in the corners and consequently look dreadful. 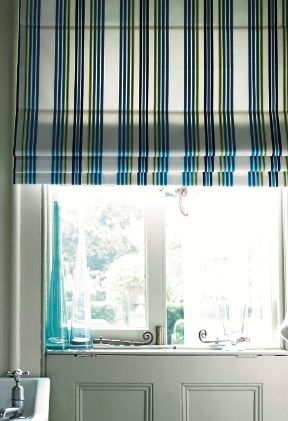 A small bathroom is the ideal situation for a roller blind and will benefit from a striped window treatment, especially if the stripes are vertical, as it will add height to the windows. If you a seeking the illusion of space, if the main decorative colour of the room is dark, if the walls are covered with pictures, if you have too many home accessories or too much furniture in a room, then no amount of help with vertical lines in the decor will help. Less is more for a minimal decor whereas lots of “bits” is more suited to a traditional home, although these days not many of us could cope with the excesses of a Victorian style decor, our lives are too busy to also have a busy looking home, not to mention fitting in the time for all the dusting. 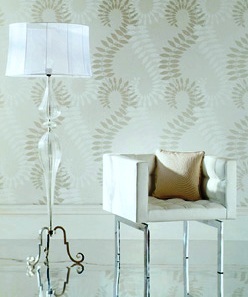 Your choice of line in a room is second only to your choice of colour and will set the overall mood of the room. As a general guide, horizontal lines create a restful feel as the lines are laying flat, a position of safety and sleep. The horizontal lines of a Venetian blind will create a visual illusion of your windows being wider than the reality and by the same token, using a wallcovering with horizontal lines such as this fabulous wallpaper will give an extra dimension to a room. The effect of rooms with tall ceilings but not necessarily large floor areas such as a Victorian house can be counteracted by using a horizontal design on the walls, window treatments and even to a certain degree with the furniture. If you try to maintain a unified level with the backs of the settees, the sideboard and perhaps the height of the top of the lampshades on the coffee tables, then the result will subconsciously give a strong horizontal line which is said to encourage peace and harmony in the room. The spiral stairs in this fabulous living room make a stunning contrast to the otherwise very horizontally inclined decor. The gentle curve of the stairs promotes a feeling of softness and as with most curves when included in a scheme will make a light-hearted feature. Note that there are not any others curves in the room as the effect would be lost and the decor would become too ornate. Downlighters are the main source of artifical lighting in this room, ensuring that there is no competition other than the stairs to the overall effect of the horizontal lines. Horizontal lines are a great way to introduce a band of bold colouring into a room whilst still maintaining a sense of calm, ideal perhaps in a children’s bedroom. The horizontal bands of bright lilac introduced by the drawers and shelves have not only created a highly decorative finish to the feature wall, but also gives a feeling of the room being wider than in reality. We are now getting really fed up with the weather and with ours and indeed most people’s Christmases in ruins let’s be positive and try to think towards and remember back to the warm summer sunshine lifting our spirits. If you are marooned at home then it’s a good time to get out the paint pot and immerse yourself in a project. 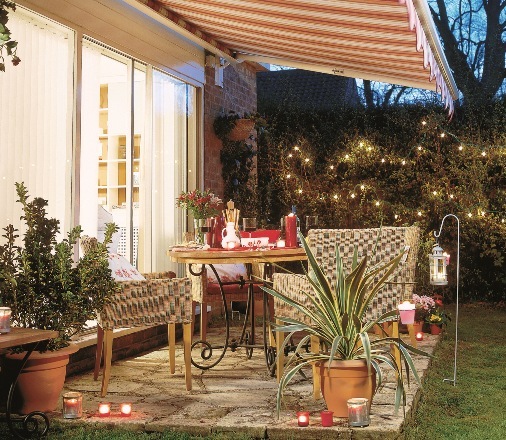 Whilst you may not fancy slogging around the freezing shops, shopping online offers the easy option, especially with sites such as poles and blinds that are accompanied by informative buying guides and a blog. Venetian blinds are a great way to dress patio doors. They can open fully out of the way when the door has plenty of traffic, most can be wiped clean, catering for the odd spillage at the barbeque and can be closed tightly at night offering complete or partial privacy as the case may be. Venetian blinds are available in a wide range of colours and many of the fabrics are also available with special properties to deal with the issues that often arise with a sunny south facing window. A vertical blind makes an ideal finish for the smallest of windows as it stacks neatly to one side of the window allowing for maximum light to enter the room or can be used in series to deal with the largest of windows. Bay windows can also be fitted with vertical blinds, with each section of the window being fitted with an individual blind. Many of the vertical blinds are also available as roller blinds so they can be used in the same or adjoining rooms for a co-ordinated look. 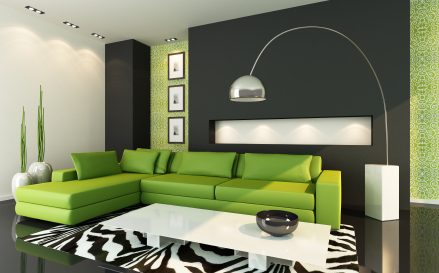 Colours of course will have a great impact on the look and feel of the room. Whoever said that Blue and Green should never be seen was talking absolute rubbish, they are on the same side of the colour wheel and to my mind as long as the blue is a greeny blue and not a reddy blue and the green is not a yellowy or muddy olive green they will make a fresh and vibrant combination. You have to be very brave to use black or dark grey as the main colour in a scheme, it can be quite claustrophobic with scary connotations. Black can however if combined with other colours and textures look absolutely stunning. Dark blue will happily blend with any colour. Usually blue is associated with a calm and restful decor but as shown with the drama of black and dark grey, looks superb in an uncluttered decor that is inherently very 21st century. Red accessories and window finishes set against a black feature wall will offer a striking explosion of colour and with just the inclusion of a bamboo plant can instantly look quite Japanese – black used in interior design is thought to be lucky in many Asian cultures. Curtain poles and blinds can be used, with a little background knowledge, to alter a windows dimensions and therefore the entire aspect of the room. A narrow window with a delightful view that passes unnoticed because the window looks small and uninteresting can be greatly improved by extending the curtain poles so that the window treatment actually sits on the wall as opposed to over the window. This will create an illusion of a bigger window as well as ensuring that as much window area as possible is left exposed, ensuring that as much light as possible can enter the room. Alternatively if you have a wide low window and a tall ceiling, then fitting the pole much higher above the window opening than normal will give height to the room. If there is an excessive amount of space above the top of the curtain and the pole, then dual the curtains with a roman blind, leaving the blind lowered to a position that hides the offending wall behind it, tricking the onlooker into thinking that the window is much taller. If there are windows in the same room that are at different heights, then you can uniform them very readily with blinds or curtain pelmets. Fitting them at a uniform height, the blinds or pelmets will block out the wall behind, creating an illusion of balance and symmetry. If you are fortunate enough to have a window where privacy is not an issue such as a penthouse apartment or a waterfront house where the view is everything, then why not opt for the absolute minimum and only fit roller blinds for the occasion when you may wish to exclude the daylight, or want to feel cosy on a cold winters night – let the view say it all. Blinds are a chic window finish that is ideal for a modern living space – their unfussy look and various versatile properties make them a great way of dressing windows. 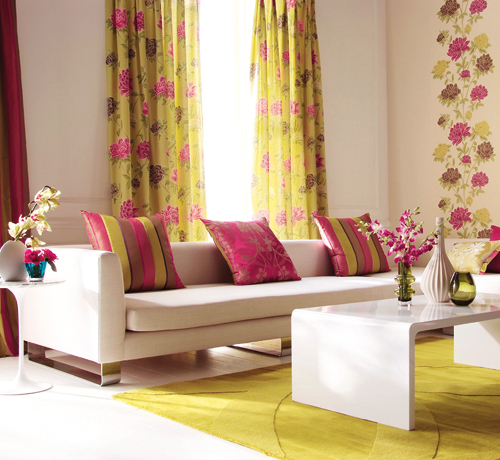 They can every bit as eye-catching as curtains but are extremely practical, hard wearing and very cost effective. If you wish to add interest and a little glamour to your roller blind, then visit our site www.polesandblinds.com and take a look at the options of edges, pulls and trims that you can select and customise your own blind according to your style of decor. Blinds can dress a window quickly, altering the look of a room within minutes, simply choose your style of blind and type of material they are made from – wood, wood weave, metal or fabric and within days your blind will be with you. Blinds can be made to fit practically any size of window and are available in every colour imaginable so at least one type will be available in your desired colour, a brightly coloured roller blinds such as the Acacia Tango Roller Blind will add spirit and vitality instantly to any room. If you are unsure how to order or get into a muddle with the choices, then please ask us for help, we will be happy to chat to you personally and talk you through placing your order. The amazing choice of soft furnishing fabrics, curtain poles, blinds and wall coverings available on the market today offer many hours of tinkering on the surface with your decor without the need to tear down walls or indeed constantly be on the move. 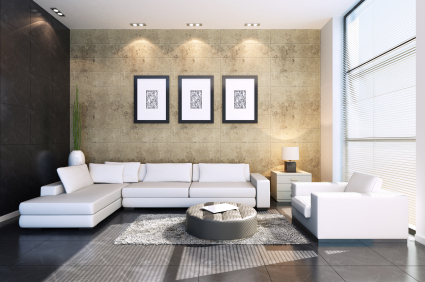 Our homes today are full of technology and can easily become cold and clinical without careful thought being given to the choice of colours and home accessories used. Keeping in touch with the natural elements and including them in some way in your decor will always help to maintain harmony and balance. A white or soft neutral coloured theme makes a great starting point as colours can be added with gay abandon or with delicate subtlety. A neutral theme has total disregard for the depth or intensity of the accompanying colours and the odd mishap can easily be rectified. White or tonal shades of white make a great choice for certain rooms such as the main or guest bedroom having the capability of being suitable for just about every look from traditionally romantic to modern luxury, bouncing light into every corner, enhancing the feeling of space and airiness. And remember that no matter how badly the day went or how uncertain you are about your tomorrows, your bed will always be your safe haven, a place to call your own for your own time and space, so make it a pleasure to be in. Buy the best bed you can afford, after all you spend a third of your life there and do not cut corners on the decor. White curtain poles in every shape and size are readily available as are all types of blinds. Minute hints of tonal shades of white or self coloured textures give a tempting relief for an otherwise completely white finish and likewise many white curtain poles have a glimmer of gilt to give just the merest touch of decadence. An impossibility but adding blue to the decor may well help – blue generally symbolizes harmony, peace and happiness and it has been proven that people are more productive and creative in a blue room making it a good colour choice for offices, but you are best keeping to lighter shades of blue as a darker blue can become depressing and have a negative effect – not congenial for a pleasant or productive working atmosphere. Blinds especially Roller Blinds are especially effective for windows in offices as they give greater control over the general ambience of the room, dealing with both privacy issues and daylight and/or sunlight levels. This stunning Acacia blue vertical blind will ensure privacy, light and to a certain degree, temperature control. 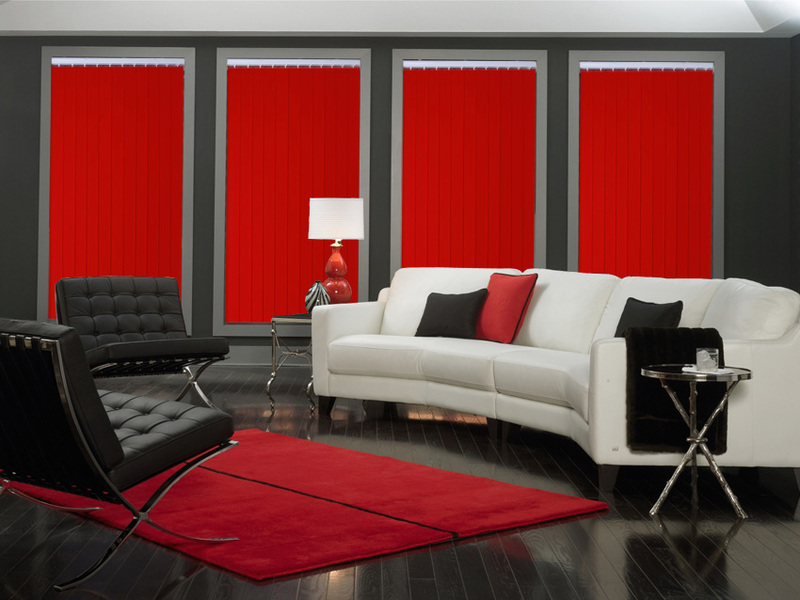 Many vertical blinds are also available as roller blinds, so should you wish to use a combination of blind types, then this option is available. As blue is one of the three primary colours, it can mix with other colours to create a completely different colour – known as a secondary colours, good examples remembered from our school days being blue and yellow make green and blue and red make purple. Bright blue used either for the walls or window treatments as the dominant colour will benefit from the use of a lighter hue as an accent colour. A really dominent blue is best used in isolation for a focal wall for although blue is very adaptable, all the walls painted in deep blue will bring in the walls, making the room feel oppressive. 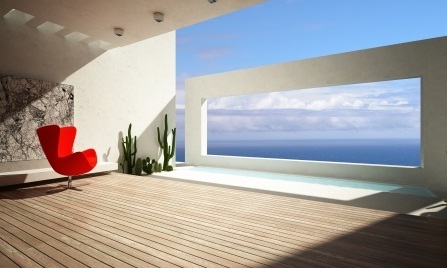 A single deep blue wall will however have the effect of making the wall receed, expanding the dimensions of the room.